Went walking and brunching with my blogging buddies Alex (The Berger Bungalow) and Autumn (Stay Gold Autumn). Took a road trip up to Indiana for the baptism of our newest godchild, had a great time seeing our close friends and their families, and enjoyed some fall weather and activities. I continued on a solo trip to Minnesota and Wisconsin to spend some time at my parent's new house and to see my sisters for a couple of days. It was so precious to be together as the opportunity is rare and has never actually happened before! 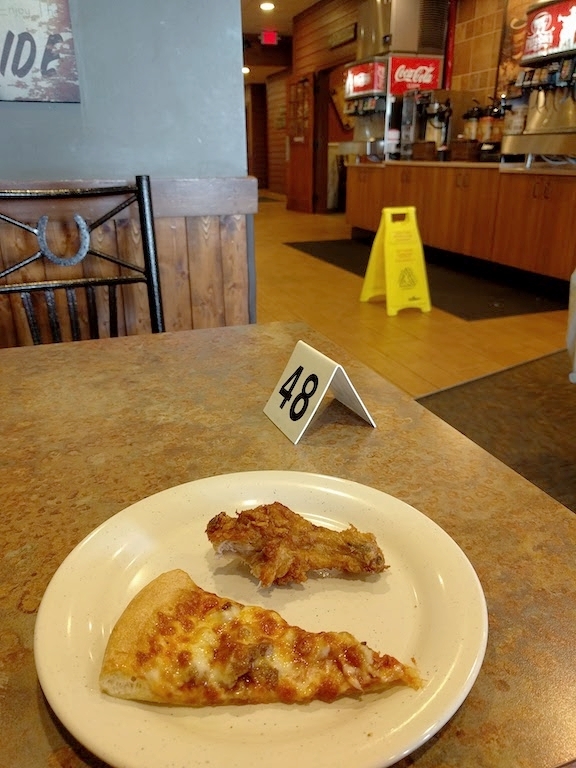 Before leaving the Midwest I got to indulge on a Pizza Ranch buffet with my mom. Hahaha - this may sound trivial, but it's a Midwest chain that I grew up on and it was fun to have it again! I baked my very first artisanal, no-knead, bread loaf! It was crazy simple and SO good. Here's the recipe. My darling husband turned the big 2-7 and we had a low key day... until December when we see the 49ers play! Neither of us have been to an NFL game, so we're very much looking forward to it. We almost got a pet guinea pig. It all happened so fast! One day I just really wanted to get a small pet, so Autumn met me at a Petsmart and long story short... I held one, Tom gave a very surprising go-ahead on the insane idea, and I nearly walked out of the store with the poor thing in a cardboard box. Thankfully Autumn and the worker talked me out of it, at least until Tom and I could give it more than a five minute thought, and as expected, we are no longer entertaining the idea of a pet... for now. Autumn and I had a pretty great laugh over the spontaneity though, and I'm pretty sure she's relieved for the poor thing (that is hopefully gracing a better prepared home by now). Started researching semi-pro cameras! From one crazy purchase to the next, right? This one is more realistic, though. Anyone have some camera recommendations? I lean towards the DSLRs, but Tom is leaning mirrorless. I'd love some tips or things to think about from my readers/photographer friends! 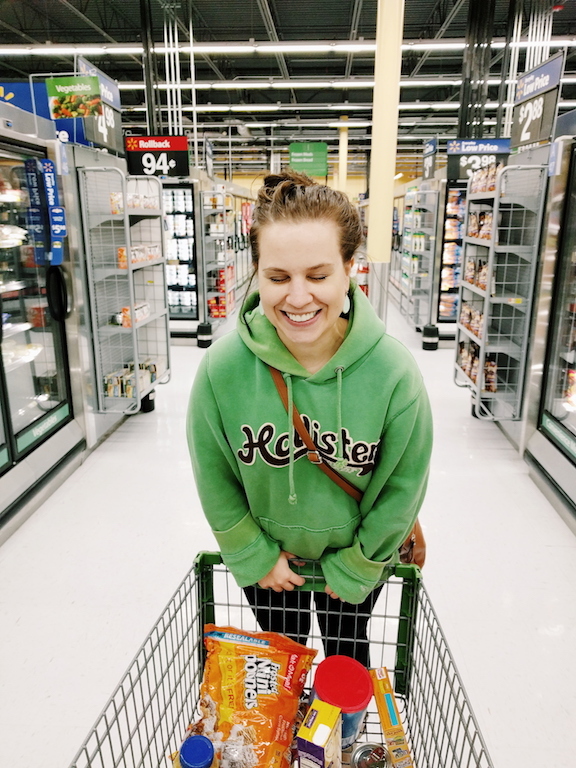 We had a typical grocery shopping date night that ended in basically a cart full of junk food. I love being a grown-up with my best friend. 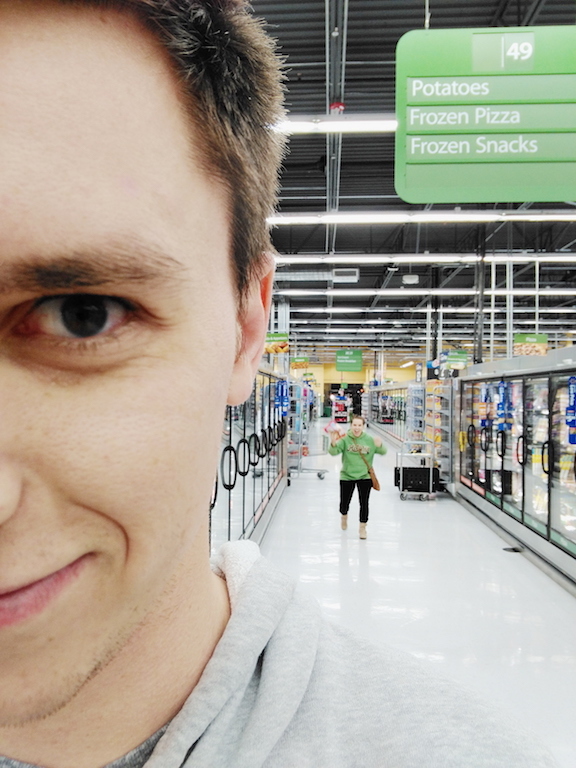 The photo below of me running down the aisle over Tom's shoulder cracks me up. Because TOTS. Said we'd try being active morning people, and promptly woke up late the next day. Carved nerdy pumpkins (Tom's won a prize at his work!) and dressed as a hunter and a doe for trick-or-treaters (see my Instagram for more). We've never had trick-or-treaters, so we thoroughly enjoyed being home last night. This was a month for the books. It was busy, but 95% of it was positive and fun. We've had some personal things going on lately that have been really difficult, but we're doing great otherwise (just being real). Also, I give MAJOR props to make-up artists. My Halloween make-up took an ungodly amount of time for an "okay" result - hahaha - but it was fun! The one downer is that just as it was starting to feel like fall here, it cranked back up to the 80's! I know, I know... first world problems. But come on - a hot cider just doesn't have the same effect when you're sweating! The Confused Millennial - Rachel is funny, relatable, creative, and informative. There is something for everyone on her blog and you can tell she is so genuine. I love getting trapped in her content for entirely too long. Brittany L Bergman - Previously The Nested Nomad, Brittany recently underwent a little rebrand and it looks beautiful! She's been a great blogging buddy the last couple of years, and I'm so happy to see her space better suit her. She talks living simply, motherhood, and more - go see! Em Writes - Not only is her blog so beautiful in aesthetics, but her posts are often fun and easy to love. Such a lovely soul! I hope you all had a marvelous October and are looking forward to November. I can't believe we're there already! Thanksgiving will be here before we know it, so Tom and I better get serious about becoming active morning people before all the holidays hit. I say this at 12:30AM. We never learn. Much love, readers - Happy November!